For most Americans, table tennis is a game. But not for Marty Reisman. For Reisman, table tennis was much, much more. Reisman once remarked that he had built a career around a game usually played in the basement next to the clothes dryer. “A funny way to spend a life,” he said. Reisman passed away in 2012, but his style and love of ping-pong live on in PaddleYou, a game improving custom ping-pong paddle service from Table Tennis Nation that is the result of decades of Reisman’s experience and his dream to make more people fall in love with the sport. It is perhaps fitting that such a unique man should come to his vocation in a unique manner. Reisman did not begin playing table tennis because he wanted to, but rather because he needed to. According to Reisman, “I had a nervous breakdown when I was nine years old and ended up in Bellevue Hospital. Ping-Pong was the ultimate escape. 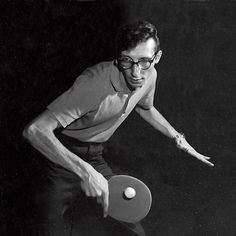 My racquet became a sensuous connection between the ball and my brain.” Soon after he began to play table tennis, it became obvious to everyone that Reisman had a gift for it. By age 13 he was New York City’s junior champion at 13. By age 16 he was putting on table tennis exhibitions in England. But for Reisman, the real point of table tennis was not trophies. The real point of table tennis was the action. Where else but the City? For an amazing cast of New Yorkers, Reisman’s was a regular haunt. Dustin Hoffman, Kurt Vonnegut, David Mamet, Bobby Fisher and a group of violinists from the Metropolitan Opera routinely stopped by for a game. Jackie Mason, who grew up with Reisman the Lower East Side and remained a lifelong friend, was a fixture. So were hard-core players with names like Freddie the Fence, Herbie the Nuclear Physicist, Betty the Monkey Lady and Tony the Arm. Several members of Meyer Lansky’s legendary street gang Murder Incorporated also frequented Reisman’s. Once Reisman’s closed for good in 1981 due to soaring rents in the City, Reisman was forced to less “comfortable” digs. To wit, the Manhattan Table Tennis Club, where betting on matches is forbidden. It should be no surprise that the company now bearing the Reisman torch, PaddleYou, set up shop in New York City and is making all of their paddles in New York. Reisman became larger than life as a result of his amazing skills with a table tennis paddle and his own considerable efforts at self-promotion. Reisman’s trademark forehand could hit speeds of 115 miles per hour and table tennis connoisseurs agree that Reisman had the greatest drop shot ever seen on the face of the earth. Reisman won 22 major table tennis titles from 1946 to 2002, including two United States Opens and a British Open. In 1997, at 67, he became the oldest player to win a national championship in a racket sport by winning the United States National Hardbat Championship. Reisman’s opponents were routinely thrashed with objects aside from table tennis paddles. Shoes, frying pans, coke cans, even garbage can lids were lethal when wielded by Reisman. Depending on the size of the bet, he would play and beat opponents when sitting down or even when blindfolded. Breaking a cigarette in half from across the table was a Reisman standard. Reisman was a larger than life figure, both at and away from the table. He cultivated an eccentric appearance, wearing both Borsalino fedoras and Panama hats. He loved to hang fashionable, brightly colored clothes over his thin physique; for his whole life he enjoyed the fact that his moniker was “The Needle.” Before beginning a game, he habitually removed a $100 bill from his roll to measure the net. Reisman had rules. Against amateurs, Reisman went out of his way to level the playing field. He would routinely spot opponents as many as 18 points, and still win the match. He would play and beat anyone. Including Montgomery Clift, the President of the Philippines in Manila and the Maharaja of Baroda. He would go anywhere for the action. Along with his longtime table-tennis partner, the late Doug Cartland, Reisman circled the globe eight times, several times serving as the opening act for the Harlem Globetrotters. Cartland and Reisman played together for a crowd of 75,000 spectators at Berlin’s Olympic Stadium, the biggest recorded live audience for a table-tennis tournament. But of all of Reisman’s rules, there was one that was paramount: No sponge paddles. In 2010, two years before his death at age 82, Reisman founded Table Tennis Nation, an organization he hoped would help make table tennis fun again. Table tennis is the most popular sport in the world, but in the US only about 8000 players participate in tournaments and ping-pong events. No one was doing anything to reach the 20 million casual ping-pong players in the US (and even more around the world). Reisman and his colleagues at Table Tennis Nation wanted to change that. And they have. Key to this effort in Reisman’s mind was the resurrection of a version of the old-fashioned paddle. That paddle is now being manufactured by PaddleYou in the only place a paddle fit for Reisman could be produced: New York City. The entire PaddleYou production process take place in the City. The new paddle is designed to help the everyday player take advantage of the sport’s technological advances while also making the game easier and improving table tennis. And through a heavy research and development process, now you can customize your own Paddle You paddle using pictures and designs from your facebook, instagram, computer, smartphone, or tablet. PaddleYou has sold its Made in New York paddle in 22 countries. Every day, the folks at PaddleYou hear stories from people around the world about why they’re buying a PaddleYou paddle and the reactions they’ve had to the product. The PaddleYou gallery is full of incredible paddles designed completely by its customers: baby pictures, soldiers abroad, corporate logos, artwork, and everything else you could imagine. So while you probably will never be 1/100 the player Marty Reisman was, you can now design a PaddleYou paddle that would have made Reisman proud. Thanks to the generosity of Reisman’s buddies at PaddleYou, five people who design their own paddle after linking to the PaddleYou site from this blog post will be chosen at random and will receive their one of a kind paddle free of charge, in honor of the memory of Marty Reisman, a one of a kind man.